Free Tour Lyon provides free walking tours in the splendid city of Lyon, once the capital of Roman Gaul and now the culinary capital of France, and thus the world! Lyon has a long history, a picturesque old town (Vieux Lyon) and lots of culture. But it is also a very modern French city, full of life, class and food! Join us on a Free Tour of Lyon to discover the city on a walking tour with an enthusiastic and knowledgeable guide. Come with us and fall in love with Lyon! Our free walking tours in Lyon are the perfect way to start your visit. Get to know Lyon with a local guide and learn what makes this city tick! We show you the best local restaurants, teach you about local culture and amaze you with the long history of Lyon. 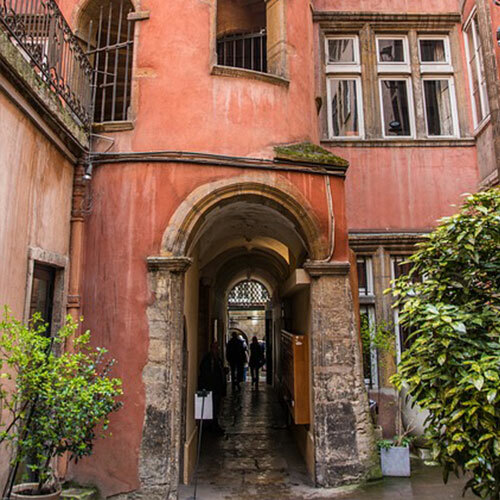 On foot is the best way to discover the little streets of Vieux Lyon and Presqu'ile. On a walking tour, you can discover some of the beautiful hidden passageways and courtyards in the old city. There are so many! Also, cathedral St. Jean is well worth a visit. We will show you the impressive astronomical clock and point you to many small details in this impressive church. Come with us today! 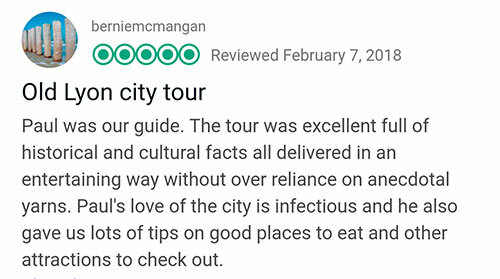 Our Free Tours are a perfect introduction to the city of Lyon. Join our free tours to get to know the history, culture and local life of Lyon. Our local guides love to show you around! We start at two of the big town squares in Lyon, Place Saint Jean and Place des Terreaux. Check the calendar to find out when to go where! We also provide private walking tours in Lyon. We can accommodate many requests and itineraries. Click to find out more. 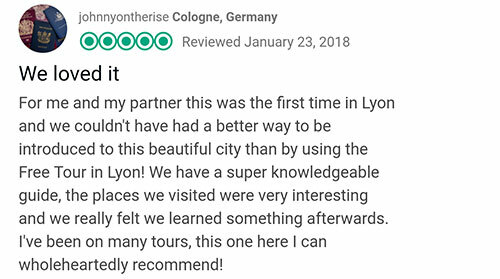 Certificate of Excellence on TripAdvisor: Click to read what other travelers say about Free Tour Lyon. Why join Free Tour Lyon? Free Tour Lyon gives you an Excellent Introduction to the city. 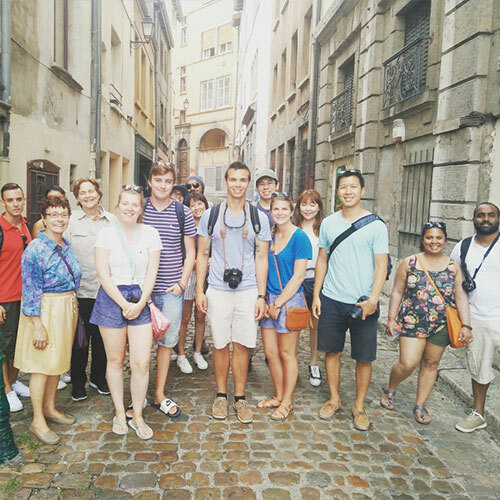 On our free and paid walking tours, you will learn a lot about the different aspects of Lyon. 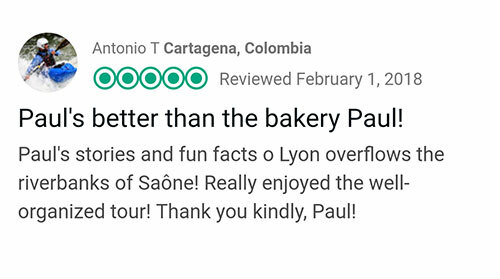 We will tell you all about the food culture, the Bouchon, the silk industry, Roman history, the Fourvière church, hidden passageways called traboules and much more. But we also love to explain how life is in this modern French city. Passionate Local Guides. We love to show you Lyon. Our guides love the city of Lyon, its history, culture and people. We love to tell you all about life in Lyon and everything that makes this city great. 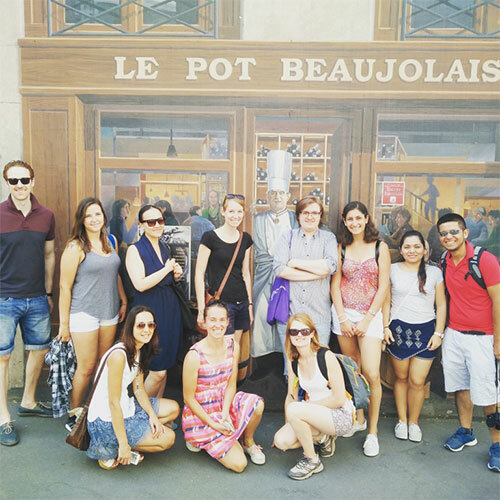 On our free walking tours in Lyon we have the pleasure to introduce Lyon to new visitors. The quality of life in Lyon is very high and we like to show you why! Come and join one of our Free Walking Tours of Lyon today! 10:00 am. 10:00 am. 10:00 am. 10:00 am. 10:00 am. 10:00 am. 10:00 am. You can also just show up, but check the schedule to see if the tour is going! 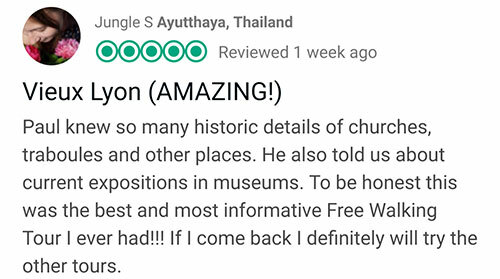 Read some more reviews our customers wrote on TripAdvisor! Here you see the latest pictures of Free Tour Lyon. Click to like us on Facebook or Instagram or to share your picture!